Box Dimensions (LxWxH) 2.35 x 1.45 x 1.4"
Fujichrome Velvia 50 Professional RVP 50 Color Transparency Film (35mm Roll Film, 36 Exposures) is rated 4.8 out of 5 by 156. Rated 4 out of 5 by Anonymous from Still learning I took two rolls of Astia 100F and one roll of Velvia 50 with me on a trip to New York. I actually liked the look of the scanned Astia photos better than the scanned Velvia shots. The contrast and color of the Velvia seemed to nearly overwhelm the scanned slides. Now, I understand that this film is usually used in natural settings, landscapes, etc. so that makes sense. In a mixed environment where I plan to take photos of landscapes and cityscapes, people, etc. I will likely use Astia or Provia in the future. I will reserve Velvia for times when I am out in nature, taking just landscapes, etc. Rated 3 out of 5 by Daniel from Beware: 3 Years Expired Velvia, as we all know, is a great film, and $6.99/roll is a great price, even for slightly out of date stock as listed. However, the film I received was marked expired “04/2015”. I received 2 replacements and both were identical, with customer service telling me they have no way of verifying the age of their stock before shipping. I’ll give credit to B&H for refunding me eventually, but be warned, what you will receive is likely far different than what is advertised. Rated 5 out of 5 by Matthew from Love this film! This film is my absolute favorite for color rendition, fine grain and tonality. The grain is so fine that it almost looks like a digital image. I've shot it with a 1968 Leicaflex SL with a 35mm Elmarit and 50mm Summicron, and the results are very impressive. I recently rented a Leica M7 with 35mm Summarit and the results were beyond expectations with this film. The film costs this much for a reason. As with all transparency films you need to be spot on with your exposures because it's much more difficult to correct them in post production. You don't have as much latitude as you do with negative films. Rated 4 out of 5 by John from Shoot some slides! Further thoughts. My previous Velvia 50 review misstated some resolution figures. The correct information is that my favorite lab scans C-41 (color negative) film at around 2400 ppi, and scans E-6 (color slide) film at around 1200 ppi, apparently because different equipment is used. Obviously, other labs will do things differently. Velvia 50 is a great film which will produce excellent slides, but the quality of the digital images obtained will depend entirely on who does the scanning and what equipment they use. Here are a couple of Velvia 50 sample images. Note: these are 100% crops from the original 1236 x 1808 scans. Rated 2 out of 5 by Tom from Misleading headline. Film expired in 2015. Not 2018. The price was unbeatable but the film expired 3 years ago. Misleading ad. Rated 3 out of 5 by Peter W. from Expired in 2015. Beware I ordered two rolls they both expired in 2015. Hopefully they were stored at low temps. We’ll see how they turn out. You get what you pay for. Rated 5 out of 5 by Bix123 from Excellent film Excellent film for who love saturation of colours and fine grain. Can you view these pictures on slide projector? Is this film still in production? Yes, I just got an order of Velvia 50 with a 2017 expiration and also Velvia 100 with a 2018 expiration. What is the expiry of this film?Thank you. 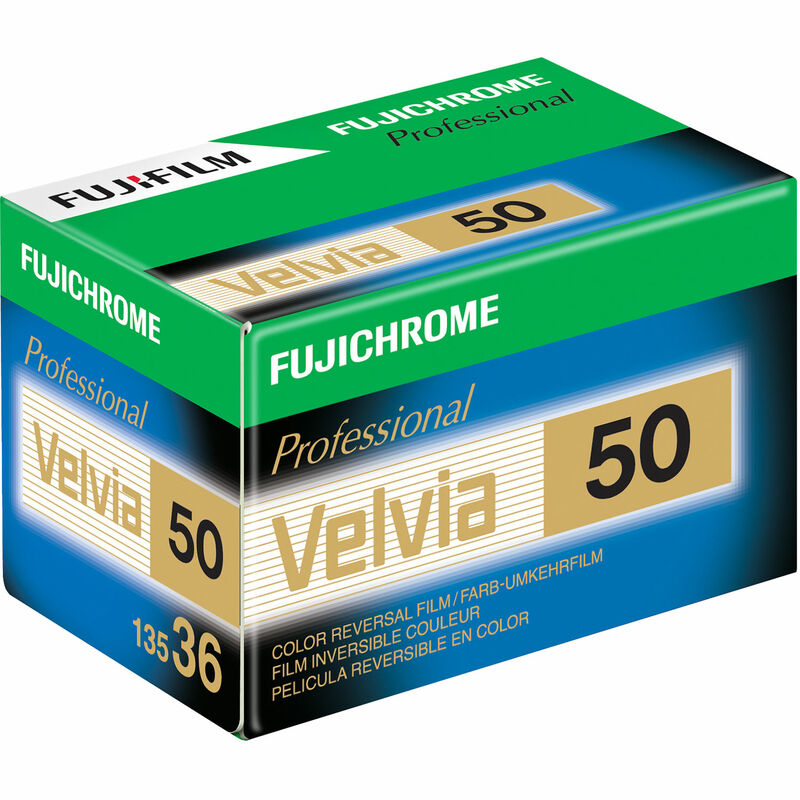 The expiration date of the RVP 135-36 Fujichrome Velvia 50 Professional Color Slide Film (ISO-50) is at least 6 months away. While we cannot give the exact expiration date of the film, any film on our site that was within 6 months of its expiration date would be sold as short dated and specifically listed as such on our site. How is this film stored? If it is frozen, then the expiration date doesn't matter as much. My experience with slide film is that when frozen it retains very good reproductive quality. 5-6 years ago I purchased a large stock of Elite Chrome - EB-3 and EBX. I recently brought out some rolls of EBX - 2012 exp. - and the developed product looks gorgeous. I purchased some of these Velvia 50 and have stored them in the freezer and expect they will be fine when I get around to using them. I have some rolls of Velvia I have had for many years and every time I have used a roll the colors are fine. Also, I take the film out of the freezer shortly before I am going to use it. I warm it in my hand for 10 or so minutes and/or put it under my leg on the seat of the car for the drive to wherever I am going to shoot a roll. I have never had any issues. Think about it. If you are taking photos in the winter, the film in the camera is pretty close to what is the ambient temperature. Of course there is a limit, but the batteries in the camera usually fail prior to that point anyway. One final thing. Prior to sending for development, I keep the exposed rolls in the freezer too.